Several of you know that I have served many years on board of the Robert Russa Moton Museum, the only civil rights museum in the state of Virginia. I had the honor to participate in an event sponsored by the museum to commemorate the kneel-ins that took place in Farmville, Virginia in 1963. Prince Edward County abolished public education in the county between 1959-1964 to circumvent school desegregation. Most of the local white churches housed grades for an all-white academy. Some African American students went to live with relatives; others were placed by the American Friends Services Committee with families around the country. A few managed to attend school in the surrounding counties. Most African American children, however, were left with few, if any, educational opportunities during that time. By 1963 the situation had become critical. The events in Farmville that year were bookended by the Birmingham protests and Danville riots on one side and the March on Washington (in which Prince Edward students participated) and the Birmingham bombings on the other. The legal case spearheaded by the NAACP to open the county schools seemed to be moving at a glacially slow pace, while new tactics like sit-ins began to change the face the civil rights movement, especially as promoted by student activists. Prince Edward students used these same tactics to protest their intolerable educational situation. The weekend of July 26th students began protesting businesses and shops in downtown Farmville, and on July 28th groups of black students attempted kneel-ins in local white churches. The students began at First Baptist Church (the largest African American Church in town) with a rally of around 400 worshippers. A group of black students attempted attend Farmville Methodist Church but were turned away at the door. When the student activists entered the Wesleyan Methodist Church, the entire congregation (except the minister and around five worshippers) stood up and left the church. The minister, whose first day was that Sunday, begged the students to leave, to which plea they left. At the Episcopal Church, ushers intended to seat the seven students in the front of the church. However, they were intercepted by Gordon Moss, the Dean of Longwood College, who guided the students to his pew. Moss was dismissed from his position as the church's treasurer the following Monday for this public display of hospitality. The students who left Farmville Methodist and the Wesleyan Methodist Church, eventually joined with students at Farmville Baptist Church. Barred entrance to the church, 23 individuals, including the Rev. Samuel Williams, one of the kneel in organizers, were arrested on the church steps. Episcopal Church commemorated the kneel in with a walking tour where the churches were open to all, including individuals barred from entrance 50 years ago. Rev. 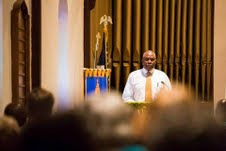 Williams, pastor of Levi Baptist Church, spoke at First Baptist, recalling, “I had the students and the demonstrators sing right there on the steps of Farmville Baptist and I prayed. Well, before we knew anything, here come the cops.” The students, he remembered, went limp as the officers carried them away. However, within the past decade, he noted, things have changed. He even preached at Farmville Baptist last Good Friday. Ms. Tina Land Harris was a leader in the NAACP Youth Organization and a student leader of the demonstrations. She was also arrested that day on the church steps. However, fifty years later the Farmville Police Department made a commendation of the students' bravery. After the commendation, a young lieutenant, who said the photographs of the arrests gave him chills (and not the good kind), turned and hugged Ms. Harris noting his respect of her bravery. Williams then led the multi-ethnic crowd of about 200 people in several chorus of "We Shall Overcome." Centra Southside Hospital provided water for the participants as they left the church for the next stop. The Town of Farmville donated a local bus to transport those who needed assistance from site to site. The participants then walked to Farmville Baptist for a time of meditation and prayer. The church had just called its new minister that very morning, and his first official act as pastor was to welcome the participants in the kneel in commemoration. At Farmville Methodist, the minister welcomed the crowd expressing his hope that this day might inaugurate new bridges in the community. Church members offered bottle of cold water ("cups of cold water given in Jesus' name") to walkers as they left. The crowd ended at Johns Memorial Episcopal Church, where I had the honor of reading a letter written by Gordon Moss a week before the kneel in 1963. In the letter, Moss explained why he would participate in civil rights demonstrations in Farmville. The letter ended with Moss's conviction that "during the last decade, and more, we have seen in this community guilt, even though unacknowledged, produce fear. That fear has bred hatred. And the inevitable product of hatred is death. The only hope for Prince Edward County is to replace the sense of guilt by the reality of love. Then love will produce concerned action, even sacrifice. Such sacrificial love will flower into justice for all mankind. Only on our knees--in fervent and reverent prayer--will we of this community find pardon and freedom and justice, for all men." 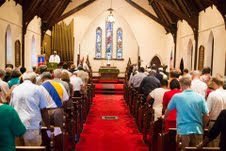 The vestry of the Episcopal Church then offered a public apology for its participation "in the complex webs of racism that gripped this community fifty years ago and since. ... Insofar as our brothers and sisters, especially our African American brothers and sisters, were harmed educationally, socially, and spiritually we wish to say that we are sorry and ask pardon (although we recognize that no pardon is deserved)." After singing, "Let Us Break Bread Together," the Rev. Everett Berryman, one of the student demonstrators in 1963, closed with the benediction charging the participants to continue, with God's help, the work of healing begun here and the pursuit of justice and peace that still eludes us. The Farmville Herald reported the initial impact of the event. "'I was just shocked to hear the apology,' said James Ghee, president of the Prince Edward County Branch of the NAACP, following the event, 'because I don’t think I have heard an apology from the pulpit within the church. And, I thought it was significant and maybe a starting point for people to begin talking.' That was the goal of the event all along, says Justin Reid, associate director for operations at the Robert Russa Moton Museum He hopes people will be more comfortable discussing the events of the past, able to 'talk across racial lines about what happened here in the County.' Reid also pointed out that the kneel-in students often are overlooked. The museum wanted to 'symbolically thank them for what they did in this community…To give these churches and the police department and the town an opportunity to thank them.'" I was, of course, a participant in this event, not simply an observer. However, Reid's reflections, as reported in the Farmville Herald above, are worth noting because they suggest the role that historians played to make this event happen. More to the point, the Museum supported a Brown Bag Lunch Series months in advance of the event to bring in scholars, who shared their work on civil rights history, and individuals, who told their own oral histories leading up to the Summer of 1963. By unearthing and telling the history of a troubled time, historians can have an important public role, in this case providing the foundation and opportunity for a community to open dialogue and to heal. The results in this case have created the foundation and possibility of positive community impact beyond the pages of articles and books and beyond the walls of a museum and its exhibits. Photo credits belong to Mike Kropf and are used with permission.